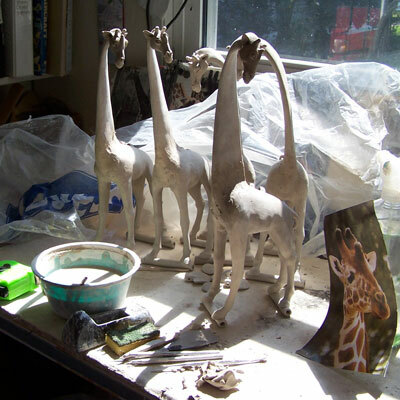 Creating an animal out of a lump of clay is a long process with lots of magic, and sometimes a little surprise. I will often begin construction with a pinch pot, which will vary in shape depending on the animal I’m making. 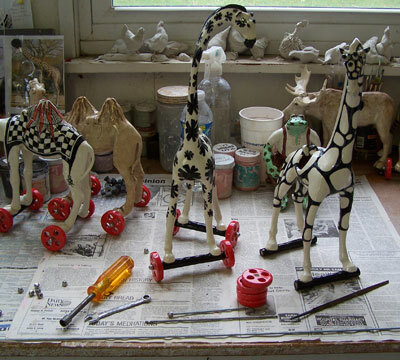 Giraffes are a teardrop shape at the very beginning of my hand building process. The connecting edges are scored to help the clay meld together. Connecting edges are brushed with water, then pressed together. The bodies are joined together, smoothed and paddled into shape. The bodies have to harden up enough to add the legs so there must be some drying time in the construction timeline. Sometimes I am forced to use a fan to facilitate the clay drying in order for me to work on the next stage. It is always a dance with time, heat and speed, which determines how fast I can continue my hand building process. I wrap the work to slow the drying process or leave the work uncovered or force the drying process so that I can keep working. The clay has to be just right and it has taken years for me to accurately anticipate the proper timing. Once the animal body is fully constructed, I will take a sponge and smooth out the body and the legs, then put it back under plastic so they do not dry out whilst I work on the heads. Once the head and neck are carved and the attachment place is scored, I am ready to attach the head, body and tail together. The neck is slightly hollow and I need to cut a hole in the body to let the hot air escape during the firings. Before the first firing in my kiln, the animal is again wrapped in plastic so the clay will even out. The drier clay will take water from the wet clay. The animal spends up to a week or more in plastic to allow for a slow dry process, which acts to minimize cracking.